June 6-8, 2002 - Long Weekend: Thursday night was Quilt Guild again. 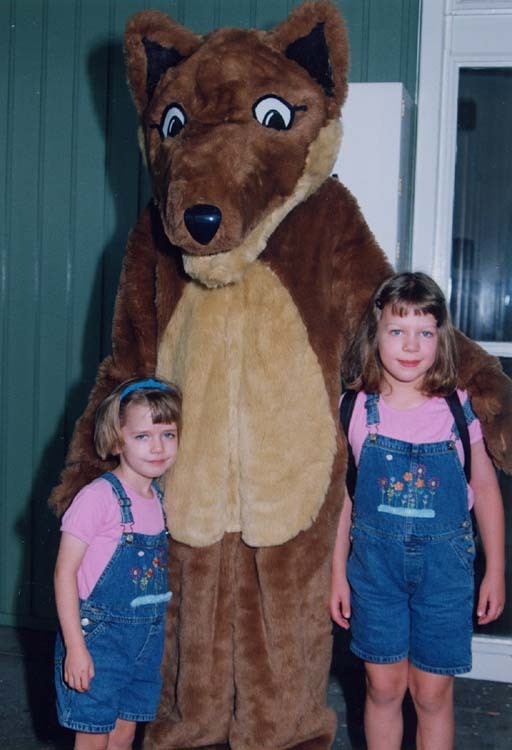 This time, Sandy had invited the mother of one of Clara's classmates (whose name also happens to be Lucy - it turns out that while Clara is uncommon in Australia, Lucy is a very common name. In fact, our Lucy has two other Lucies in her Kindy class!) Speaking of our Lucy - she has really returned to her old chipper self since her tonsils were removed. Her appetite is much better, and she and Clara seem to spend half the day in giggling fits. This coming weekend is the three day weekend celebrating the Queen's Birthday. Lots of things are going on. One of them is the big annual Model Train Show in Adelaide. Tim, Clara & Lucy went to it on Saturday. There were several very large layouts - and, not surprisingly, most of the layouts featured American themes. 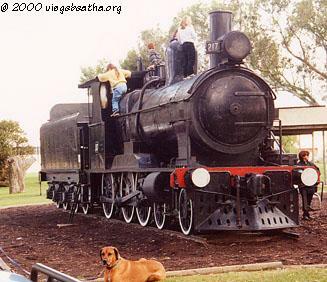 One of the largest was a modular N scale layout titled "Montana", which was probably on the order of 70 feet around the perimeter. 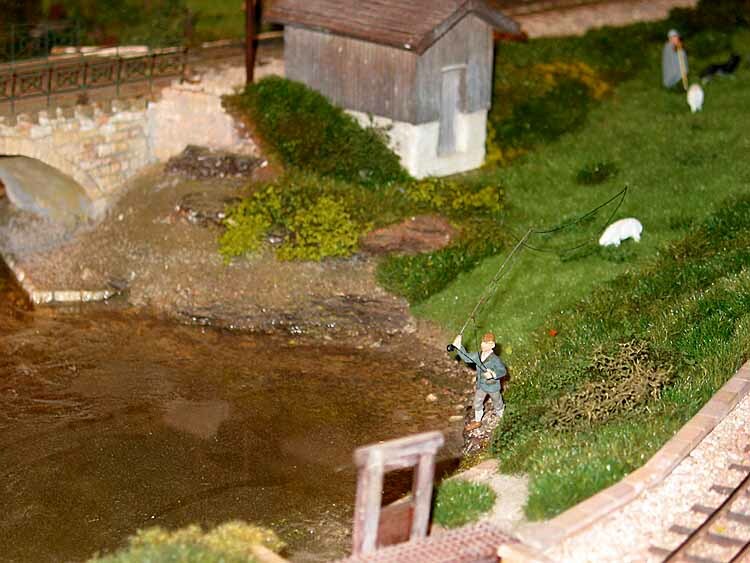 However, there were some variations, including a Swiss layout which had a fly fisherman fishing beside the tracks. 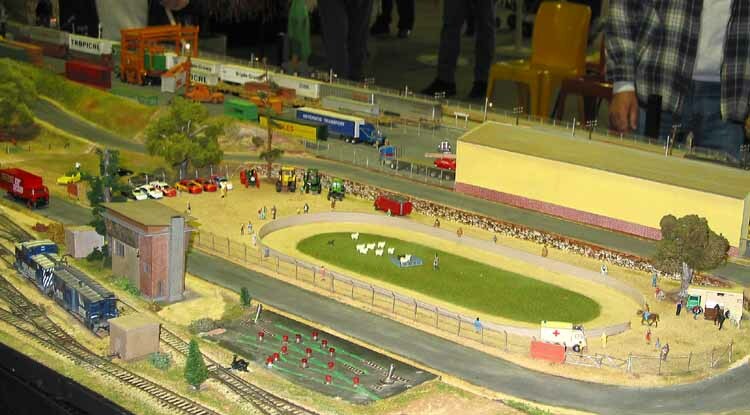 Another layout, while seemingly American in theme, featured a cricket pitch and what looked remarkably like the Tassie Country Fair we went to, including sheep dog trials, tractor displays, horseback events, and a car show (but note the Montana Rail Link cars in the left front corner). 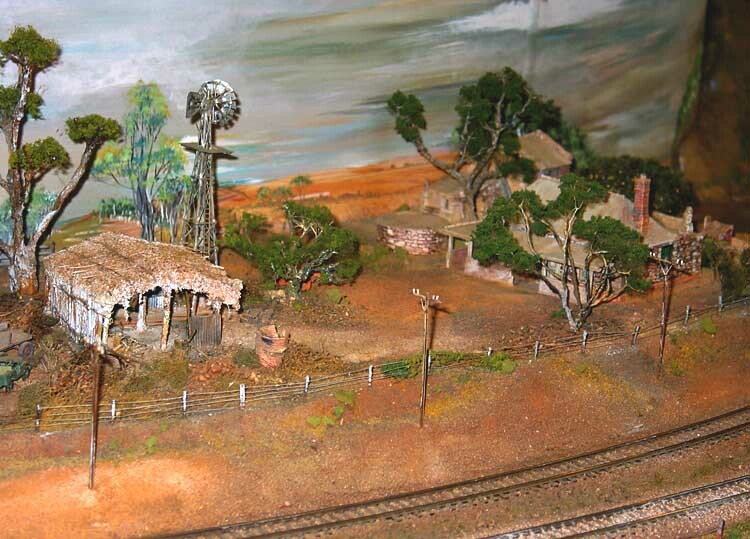 There were also a layouts which were clearly Australian in nature, which showcased the gum trees, stone construction, and red earth we've come to know. Meanwhile Sandy was working around the house. Among other projects, she is planning where to hang pictures around the house and working on a "wall plan" to be approved by our landlords. Then the "authorized" picture hanging people will come to put them up. A bit more complicated than just asking Tim to dig out his hammer and some picture hooks... Once the things are on the wall, it will really feel like we have made this our home. However, just when life here starts to seem familiar and old hat, some new wonder pops up, and we marvel at the differences here in our new surroundings. Last week it was a wonder of nature that caught Sandy off guard. One morning as she was walking down the hill at school and around the tennis courts to take Lucy to her classroom, she happened to look up at a fairly large bushy tree (a tree that she has been walking past everyday for months now) and noticed huge bright red flowers all over it. Could it really be? Yes, a poinsettia tree in full bloom! Quite an amazing sight for someone who has only seen them in pots at Christmas time! Of course, here, they are blooming now in early winter, so when Christmas rolls around, people here in Adelaide have to have them flown in and buy them in small pots for their Christmas decorating, too. June 9-16, 2002 - Visiting: Sunday, we spent the afternoon at the home of Anj & Peter, parents of Clara's friend Katarina. We had a very nice lunch, and enjoyed ourselves greatly. They have a second daughter who is a year older than Lucy, and they get along well together. The four of them spent a lot of time outside, making the cat very nervous! 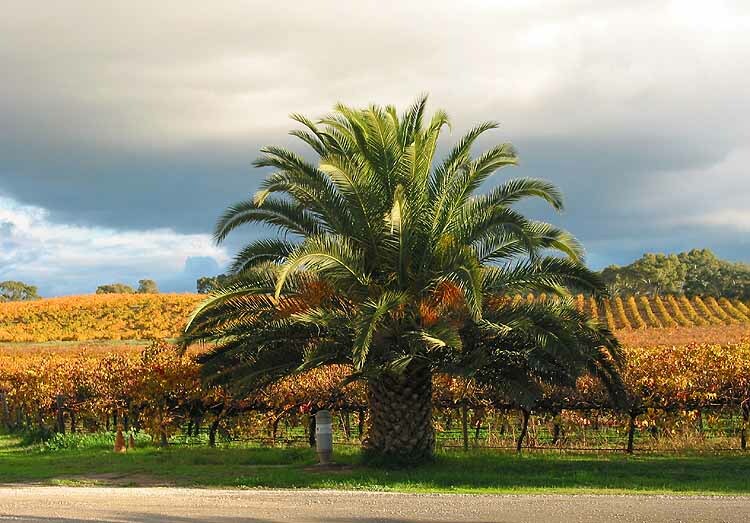 Monday, (the holiday representing the Queen's Birthday) we had intended to head out to the Barossa - but the forecast proved unreliable, and we woke to rain. 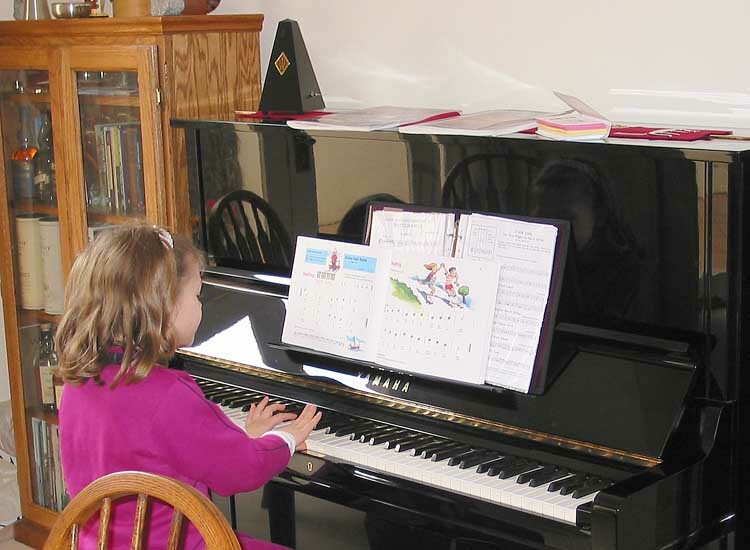 So, we puttered around the house, then went out and bought a second-hand piano in the afternoon. 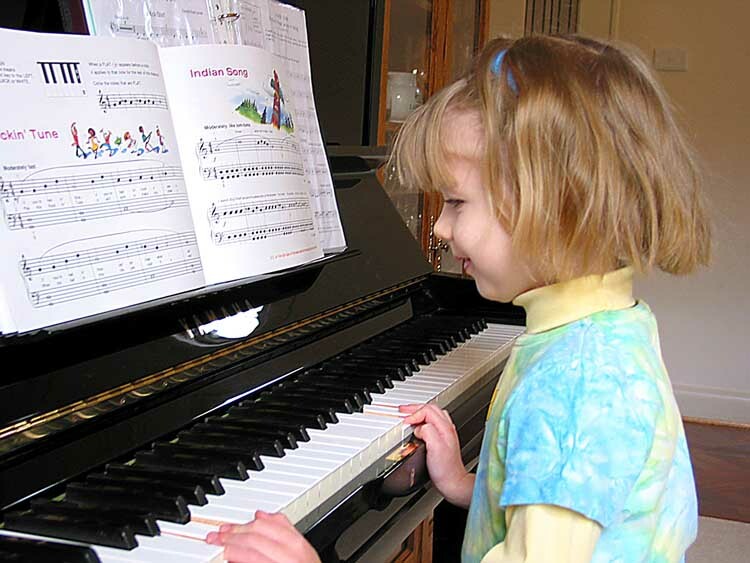 This is not quite so precipitate as it sounds, as we had been thinking about and looking at pianos for awhile, having left our piano in storage in Seattle. Since this seems to be turning into a recital of "things that have struck us" - one of the other interesting things is that it is winter down here (for us the winter solstice is only a few days away) - but the lack of native deciduous trees combines with the mild climate to make it seem unlike winter. All the gum trees are still fully covered with leaves, and the rain of the last few days has greened things up substantially. The trees still maintain "all the shades of dull green in the world" to paraphrase Rob Sitch from A River Somewhere - there is also a famous poem entitled "Australia" which opens with a similar line "A Nation of trees, drab green and desolate grey..."; however, the grass, small shrubs, and imported plants are bright green. Even on our street, the imported Jacarandas are only slowly losing their leaves. While we were in Tassie, the only native decidious tree, a beech, was changing to a brilliant gold color. While the beech trees of New England in the US turn a similar color - they are NOT closely related. Since it is the only native tree to do so, it attracts great attention (vaguely like the tamarack, hackmatack, or larch, depending on where you're from, which attracts attention for the oddity of being essentially the only deciduous conifer in New England). Unfortunately, we had to end the week with another trip to the doctor - Clara has just been steadily going downhill this week. She finished her antibiotic on Wednesday, and the headaches, chills, etc. came right back as bad as they had been a couple of weeks ago. Turns out her tonsils had even more pus and inflammation than before, so she is on another antibiotic. We're hoping to speed up the scheduled visit to the ear, nose and throat specialist, since it looks more certain now that she will need her tonsils out. At least Lucy has been well and perky this whole time. Saturday, Tim & Lucy went shopping in the morning, while Sandy & Clara worked on making a beaded butterfly. In the afternoon, Clara went to play at friend Rebecca's house, while Tim went to a scotch tasting at Bailey & Bailey, featuring a representative from Gordon & MacPhail's of Elgin (one of Scotland's oldest independent bottlers of whisky) whom he had met several years ago in Scotland. Afterwards, Tim went to Craig's house, to sample a few more drams. In the evening, we all finished watching the movie Cool Runnings, about the Jamaican bobsled team, which we had started the night before. 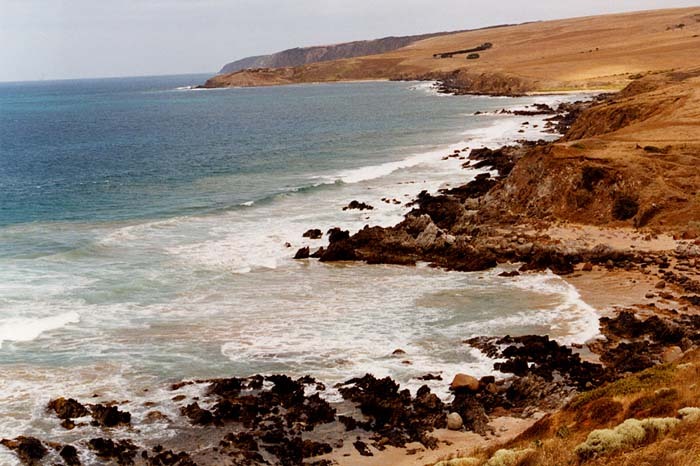 June 17-19, 2002 - Fall in the Barossa: Sunday, we finally made it up to the Barossa. 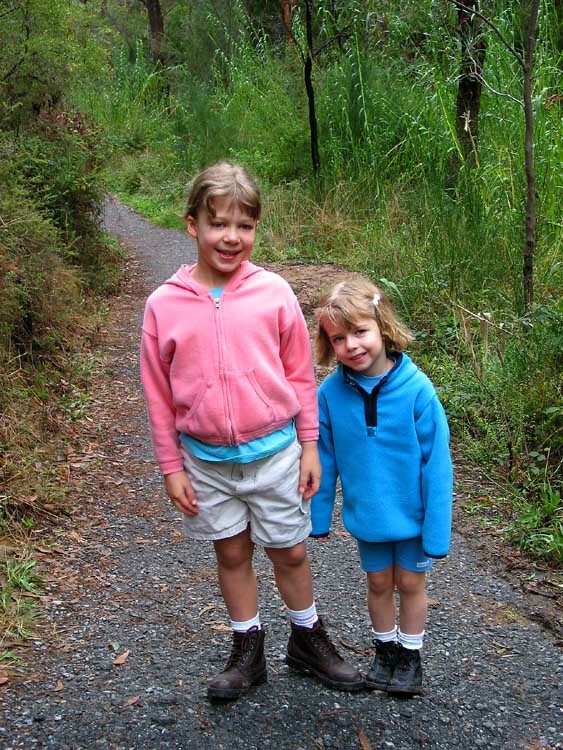 We made the loop up into the Adelaide Hills, through Balhannah, Woodside, Mt. Torrens, Mt. Pleasant, Eden Valley and Angaston, stopping at the latter for lunch. 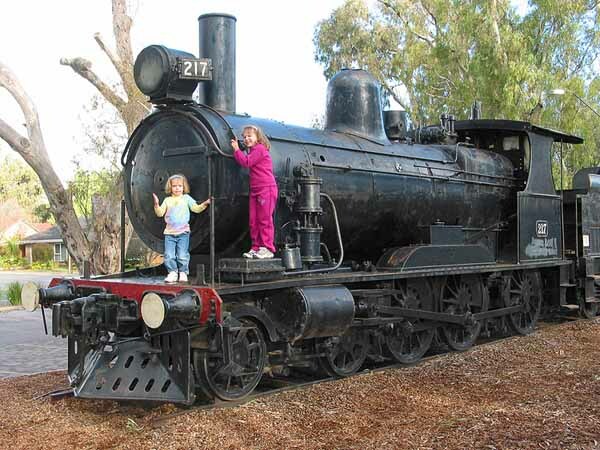 Then it was on to Nuriootpa, where we stopped at the park with a old steam engine, which the girls finally got to climb on (two years after Tim first showed them the pictures he took of the park and the engine on his first trip over here.) 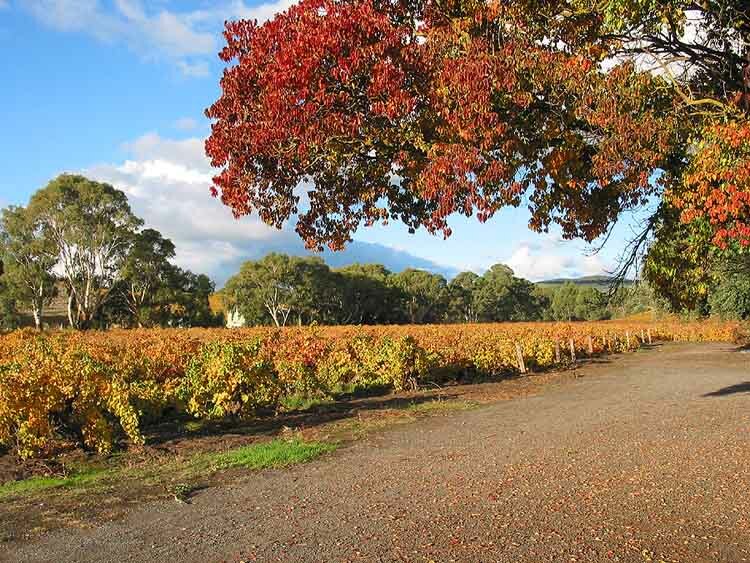 We were also struck by the color of the vineyards, and some of the imported trees. See, for example, here and here. 1. Freeze chunks of mango. 2. 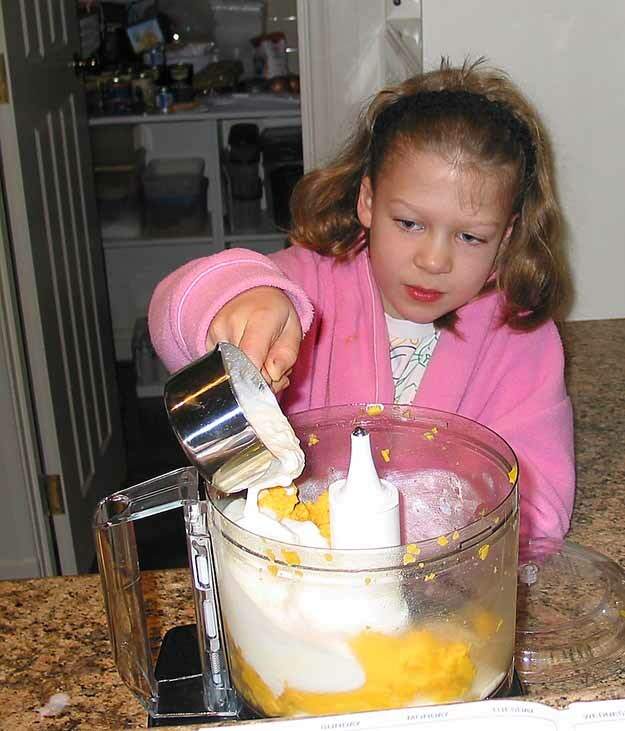 Process mango in food processor until smooth. 3. Add yogurt and mix briefly. 4. Add water, sugar and salt. Mix. 5. Taste and adjust sweetness as needed. 6. Serve chilled. Garnish with a mint leaf if desired. June 20-July 7, 2002 - Odds and Ends: It's been a very long time between updates; we've been quite busy with end-of-term activities. Friday, Clara's class put on a shadow puppet show they had been preparing for some time. They've had a student teacher (Miss P. to the girls) for many weeks, and she was the one who worked with them on this. The girls each made puppets (Clara's was a crab), and then they recorded all of their dialogue in advance, so that on the day of the show, they only had to remember how to move the puppets. Friday was the last day for Miss P., so they put on the show for the parents, along with a recorder concert, and then everyone celebrated with cake and cookies. 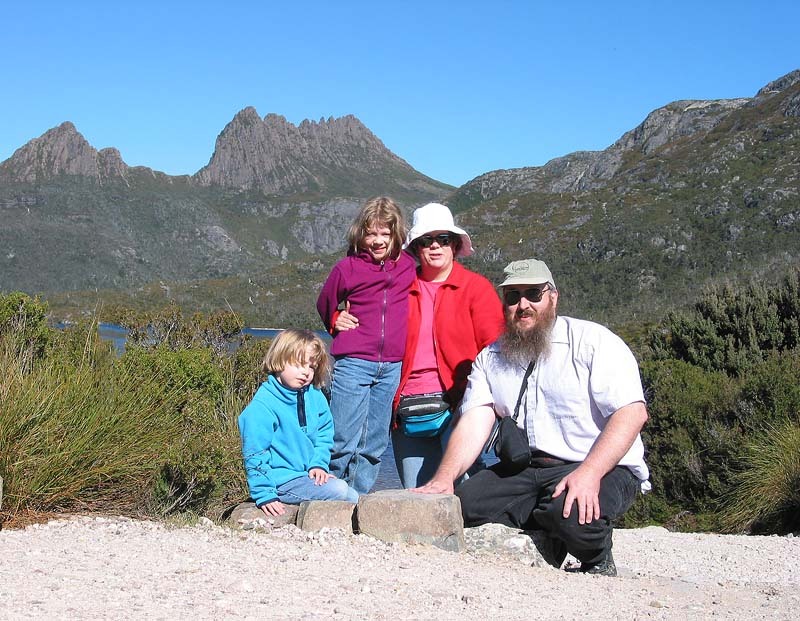 This was also the week when Clara's regular teacher returned from a two week trip to the States. She and her husband went to a wedding in Atlanta and visited a candy factory near Chicago (they own a candy business here as a sideline - which fascinates the Year 3 girls no end - and explains all the candy they get from their teacher for various holidays!) Unfortunately, one of their pieces of luggage - containing candy and some readers (books for the girls) got run over by a baggage truck, and got smooshed! After the puppet show we all went for haircuts - and it seemed to have quite an effect on Lucy, who wanted her hair cut quite short. Since it has been cut, she has been so happy not to have to keep brushing her hair out of her face or hassling with clips or hairbands - the increase in her natural giggly behavior has been quite amazing. The following week, Clara stayed home with Sandy on Thursday and Friday in hopes of getting over her lingering tonsillitis. The rest seemed to do her a lot of good, and on Friday afternoon, we got good news from the ENT (ear, nose and throat specialist) - inspite of the stubborn case of tonsillitis, he did not recommend taking her tonsils out at this point, and everyone was relieved at that news. She now seems to have finally beaten the infection, and it shows in her behavior - she's had a lot more endurance, and has been very cheerful and perky the last few days. Sandy spent much of Saturday and Sunday checking out her new sewing machine, and mostly completed a quilted table runner in Easter colors. She is leaving for five days of quilt camp in Roseworthy (up north of Adelaide in the wine country) in mid July. Tim and the girls have a variety of activities planned - with the girls adding more all the time! One of the issues that has been in the news lately is debate over whether Australia needs a Bill of Rights. Unlike the US and many other countries, Australia doesn't actually have constitutionally-guaranteed rights for citizens. This has come to the fore in the wake of September 11, and the suggestions for new anti-terror legislation which could be invasive of personal privacy. We hadn't really noticed any indications of the lack of a Bill of Rights until recently, when a TV show talked about censorship of record albums - one in particular was about fast food (is it art? Who knows! ), and touched upon McDonalds. This album was withdrawn from the Australian market within days of hitting the street under tremendous legal pressure from McDonalds Australia. However, it is currently being sold in the US and other countries around the world - without a word from McDonalds - because in those countries, the right to free speech protects the musicians. One of Sandy's major activities over the last couple of months has been preparing for Clara's birthday party. They considered various themes and venues, such as at a riding stable (which was discarded due to the chance of a rainout - Clara's birthday is now in the winter, not summer!) Other options were explored, with it finally coming down to a party at home, with a science show. Finally the day Clara (and Lucy, too) had been waiting for arrived. Ten girls from Clara's class, plus Lucy's friend Jessica, showed up, for a total of 12 girls. Allanah and Jessica's mom Jacquie showed up early, and stayed to help - which worked out well. Sandy had organized enough activities to keep everyone interested - making bead butterflies to start, opportunities to play with the "Bop-Its" Tim brought back from America in February, then outside for a "Dancing Popcorn" experiment, along with bubbles, jump ropes, etc. Then inside for a science show by the lady who runs the mobile science shows (usually for schools) from the The Investigator Science and Technology Centre here. The show involved lots of balloons, explosions, liquid nitrogen, etc. She kept the girls riveted for an hour. Then it was time for cake and ice cream, followed by opening presents. Finally, there was bingo for those interested, while they waited for their parents to pick them up. Several of the moms commented about how much their daughters talked and talked about the fun afternoon, and Clara said it was "wonderful." Saturday night, we attended a housewarming party on the next street; this was put on by Donna (from Nebraska!) and her Australian husband, Tony. When they moved back here a few months ago, they nearly rented the place next door (you may recall the excitement we mentioned back then - as they have a 5 year old daughter). However, our landlord is allergic to cats, and they have a cat. So they ended up buying a place just around the corner. Donna remembered that the property agent had mentioned we had two little girls, so she and her daughter walked over one day and introduced themselves to Sandy, and invited us to the party. We had a good time, and met some more interesting people - including a British expat family (with three young daughters - 6, 3, and 9 months) who live on the street - however, they may be moving back to Britain in a few months. Sunday, Clara went off to another birthday party - this for the Lucy in her class, who lives on some property up north of Adelaide in the hills. Lucy's family lives on thirteen acres, and one of the highlights of the party for Clara was being able to ride Lucy's pony, Stormy. Last web page update was December 4, 2003.